Since this year I had to have a jumpstart for reading which began with the discovery of the New to Me challenge , I’m glad to inform you all that I did indeed find my booster pack in the form of Jericho Sims: so a big thank you to T. Mike McCurley for providing the catnip for reading. After crossing paths during CampNaNoWriMo, T. Mike McCurley’s books were always sitting on my radar to read yet I never got around to it and now I’m on the second book and eagerly wondering what happens next yet trying to pace myself to enjoy things more (slightly masochistic I know) but I don’t want another Game of Thrones type thing to deal with. I don’t want to ruin the story for anyone and the first introduction to this mighty likeable character is a very reasonable buy from Amazon (or free to read if you have the prime unlimited thing which I hope gives something to the authors). I even managed to kick myself into leaving a review on Goodread which I should do for books but am often too lazy – sorry authors but I’m trying now. Any excuse to pin up some underused photos! When is apricot not an apricot? Ok I’ll get my coat..
1. What’s number 1 on your bucket list? Erm maybe to start a bucket list? I actually don’t have one, I prefer to just take the opportunities as they come rather than sigh at a list every time another year goes by without the accomplishment. 2. What’s one of your guilty pleasures? Watching really cheesy films (especially Christmas ones), I don’t just mean bad chick flicks, I mean full on Hallmark type romance ones. Sometimes it’s just nice to get that heartwarming ending that is expected of that type of film. 3. How do you envision your handwriting if it were a person? Would you be friends? My handwriting is a little bit unstable and tends to change depending on circumstances and moods. As a person I imagine it would be pretty much the same a little whirlwind of emotional baggage that changes every hour of every day…wait did I just describe myself? I think we could be friends, well some days. 4. If you could bring someone back from the dead, who would you choose? Eww this just sounds gross, I’ve seen some of those zombie movies and they ain’t pretty. Although if we are talking in a nice clean skelatal form like Scraps from Corpse Bride then I will opt for my cat so he can once again stroll around thinking he is a dog. 5. What is your kryptonite? Cute helpless animals – No matter how angry I am a cute baby otter can sway my attention – Anyone seen finding Dory? 6. If you owned a restaurant, what would be the best selling dish? Surprise stew! Sometimes it works out spicy, sometimes bbq style and sometimes just plain with dumplings. I don’t really start out with a plan but it always seems to work out in the end. 7. What is your favourite part about blogging? The random interactions. In the real world we are all so stuck in our own little bubbles, and penned in by our status in life that we often don’t interact with people that we would always choose but by those people our surroundings choose for us. Through blogging you are able to find interesting people that might not be within your usual sphere. 8. Do you have a crush on any fictional characters? I’m guessing the obvious one would be Mr Darcy but if I’m being honest I’ve always had more of a thing for Brontë’s Heathcliff anyway. But if I’m steering away from the classic then I think I would opt for the odd choice of Geralt of Rivia – yes this is me crushing on the Witcher. He has just about the right amount of passion, fight and oddness to make it work for him, and if you haven’t read the books then these come recommended. He has, shall we say complex relationships yet there are definitely some heart racing moments in there. 9. What is the best writing advice you’ve ever received or heard? 10.Which of your blog posts is your favourite? A combination between two great loves and something I wrote after discovering a really friendly twitter community among Warcraft players. Nominate a blog(s) and give them questions to answer. Link your nominee(s) and let them know of your nomination. However being a rule breaker and not wanting to try and being unsure of who would appreciate a nomination and who would not need the extra writing then I am not going to choose but I encourage anyone to take up the mantle and if you are so inclined then here are my questions. If you could be a comic book hero/villain then who would it be and why? What was the last film you saw in the cinema and did you enjoy it? If you could only eat only thing for the rest of your life, what would it be? Do you enjoy reading and if so which genre do you enjoy most? Would you rather be in a life like an old Western film or a Sci-fi one? If your characteristics were an animal what would it be? When you were a child what did you wish you could be/do? Given the choice would you want to be cryogenically frozen? What landmark have you always wanted to see? Is there any advice you would give to your younger self if it were possible? If anyone does use these questions for a blog post then please drop a note in the comments and I would love to pay a visit and read them. I’d be a chubby, fuzzy ball of voracity. It lay, glaring at me. Bold as brass but far more flashy. It wasn’t meant to cause offence of course, just inspiration: an invitation from a friendly source with the aim to inspire. Yet it lay on my screen, blinking out it’s gesture in defiance of my inability to react. It sat, expectantly in my list, silently demanding a reply with its innocent face. For a time I stared back, waiting to see if I could scare it into submission, assert my own blank dominance and allow it a healthy retreat. But the invitation stood its ground, raising my heckles and taunting me with its propitious prompt. It mocked me for idleness, chided the brain numbing sloth I had succumbed to, and spurred me into action. The singular word became clear. It was an invitation to write. After finally feeling the urge to actually get moving and do something, I realised that what I need are a few nudges here and there to start the momentum and if left to my own devices I can happily just eat cheese and binge watch Netflix. So in order for this not to happen (erm continue happening) I felt it was about time to find myself some new challenges or goals .. easy ones to begin of course. One of the oddest things about last year is that I didn’t really seem to find the want to read, which is a strange place for me since I love reading and always have done, even as a child I would rather sit and read a book than play kerby (yes that exciting game of hitting a ball off a kerb and waiting for cars to pass) or tag with the other kids. Yet for some reason 2016 just was not a reading year..at all. In fact I can’t think of one single book I read over those 365 days which is not only sad it seems alien to me. Now I think it is time to put something in writing so this doesn’t happen to me again. How can anyone expect to write if they don’t also read? .. ridiculous! 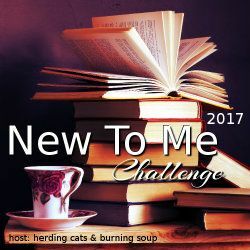 So today I took a look around at some blog challenges and decided to register with Goodreads in order to nudge me to get at least 12 books read this year, also I found The Herd Presents blogspot that encouraged me to actually read outside my usual material. So this year I shall be trying a different genre or three. P.S Any recommendations are welcomed. Ever have that feeling of being too thinly stretched in life and wanting to push forward but not being sure of the direction you want to go? Well I get this all the time. I have always been slightly envious of those people who have seemingly got it all together, who know what they want out of life and just go for it. People that have a clear passion for something or a true calling if you will and they just work hard in that area to become the best they can be at it. How do they do that? No matter how much I would like to I simply cannot sit still with one area of life for long so instead I find my interests flitting from one thing to another and then back again as whim demands. In fact I think my longest standing relationship with an interest must actually be with World of Warcraft and even now I am finding less time to enjoy this and more time wanting to focus on more productive outlets. It’s not that I am actually as flippant as it appears, I do love and have a passion for all the things I do (well except the obligatory things) but I cannot just keep to one particular thing, I feel my crafting highlights this best of all. Yet I am starting to wish that I could at least settle in one area for a while and explore how far one can go or at least get organised enough that I do something instead of waste time wondering what I actually want to do.